Two of the most striking buildings in New York City face each other on opposite sides of 5th Avenue: St. Patrick’s Cathedral and Rockefeller Center. The contrast between the two is iconic of the difference between “the City of God” (all that is ordered towards God) and “the city of man” (all that is ordered to man without reference to God). Rockefeller Center is a massive monument to the achievements of man. It contrasts starkly with the Cathedral because it is imbued with secular humanism and its art is tinged with the theme of pride and defiance. The overriding emphasis is on man and what he can achieve on his own. 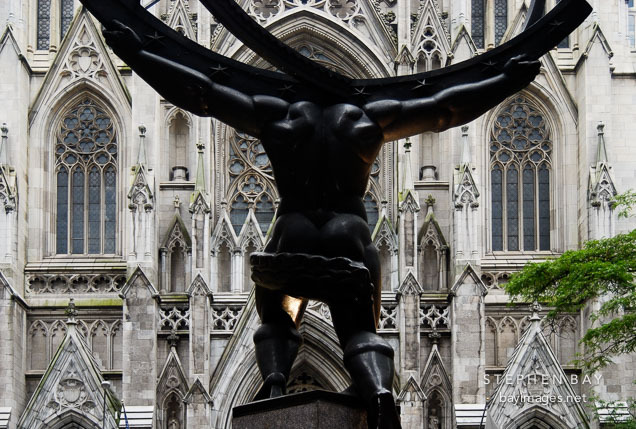 Two of Rockefeller Center’s most prominent works of art – Atlas and Prometheus – are both Greek mythological figures who represent defiance of and freedom from divine power. They were Titans who rebelled against the Olympian gods. Atlas led a war against the Olympians and was punished by being forced to hold up the heavens from the earth for all of time. Prometheus gave man access to the divine secret of fire, contrary to the will of the Olympians, and was punished by being chained to a rock and having his liver eaten for all time by massive eagles. Statue of Atlas before Saint Patrick’s Cathedral. New York City, New York, USA. St. Patrick’s Cathedral offers the antidote for the disorder that is embodied by the art of Rockefeller Center, and by much of New York City for that matter. Throughout the city, we find proud testaments to the achievements of man, and the enticement of promises of what we ourselves can achieve. We are bombarded by noise, confusion, and distractions, but inside this Cathedral, this place of God, we experience harmony and peace – we experience silence in the city. Outside we experience the dysfunctional city of man; in here we experience the ordered and harmonious City of God. Outside these doors, the city of man celebrates the emancipation of the ego and idolizes personal freedom. However, inside these doors, the City of God, all things are celebrated in their relationship to God. Contrary to contemporary thought, the ego can only find true fulfillment when it looses itself in God. By allowing itself to be dependent on God, for Whom he was made, the person finds true freedom as all of his energies and capacities are directed toward their natural end. The effect of this Neo-Gothic cathedral is to de-center the ego of the person by causing him to reflect upon a cosmos that is greater than himself. Everywhere we look, we see celebrations of the beauty of creation: everything from plants, to humans, to angels. This cathedral thus encourages what Bishop Barron calls a “cosmic consciousness” – an awareness of the whole of creation and our relatively small place in it. We cannot escape the fact that we live in a city of man full of noise and disorder, but we should take heart in knowing that within this great city of man, the City of God is present and growing. It is present here in this Cathedral and in every church where the Eucharist is present. When the city of man becomes too much for you, make your way here and allow yourself to find silence and peace in God. In this beautiful building, we experience an architectural foreshadowing of the City of God, the New Jerusalem, that awaits us in Heaven. Come here, remember that you are a citizen of the City of God, and then bravely go back out into the city of man, knowing that wherever you go, you bring the City of God with you.